To increase readership of their periodicals, editors often recruited well-known authors to write special features or articles. 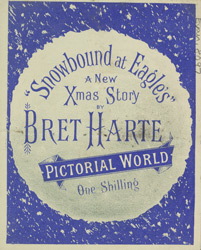 Bret Harte was one of America's leading authors and had published many poems and stories. His contribution of a Christmas story to 'Pictorial World' would have interested avant-garde Victorians who would have discussed his article in fashionable coffee houses.